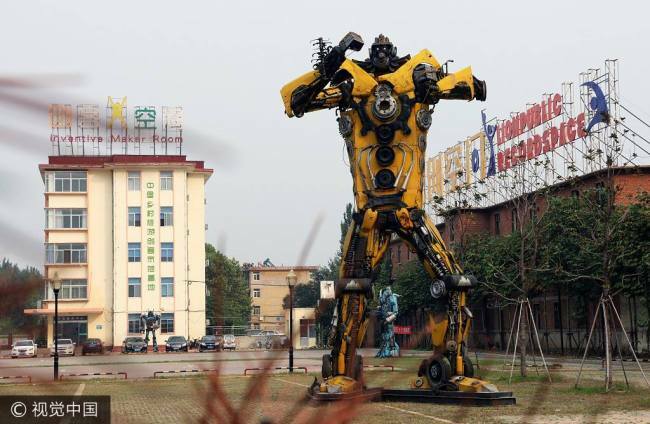 Profile：垃圾变“钢铁侠” Trash transformed into "Iron Men"
These "Iron Men," standing several meters tall(高), are produced(制作) from discarded(废弃的) motorcycles, auto spare parts, gas tanks(?#25302;? and scrap iron(废铁). The creator of these amazing metal(金属) works(作品) is retired(退休的) technician(技师) Liu Konghua who lives in Zoucheng(邹城), Shandong Province. Without any pre-design, the talented retiree has drawn his artistic inspiration(灵感) from the scrap(废料) he collected, transforming(改造) abandoned exhaust pipes(管子) into the "Iron Men's" muscles(肌肉) and old vehicle wheels(轮胎) into joints(关节). The future is subject to various uncertainties.